Today we’d like to introduce you to Tam Willey. Tam, can you briefly walk us through your story – how you started and how you got to where you are today. I have lived in Jamaica Plain since 1998 where I have been mostly self-employed as a local Handy Person. I like fixing things and doing odd jobs but more importantly, I like meeting and connecting with all kinds of people. There is an intimacy of getting to know people in their homes and taking the time to understand the various complexities of individual needs. In my efforts to establish trustful working relationships, I work hard to keep the lines of communication open. I get to see the more unseen sides of people’s lives that are often absent from their professional or outer presentations. Over the years I have noticed an increase in stress levels among many of the people I work for who work long hours, don’t get outside, and hardly have time to enjoy their homes or their families. I have noticed how I am affected by this web of interconnected stress and also how I contribute to it and it troubles me. I started hiking and backpacking when I turned 30 (10 years ago) and when I went into the mountains, I noticed that I felt a sense of freedom and an ability to truly relax psychologically. Even though I was physically pushing myself up mountains, I finally found a way to put my brain was at ease. It wasn’t long before I began associating my trips to the mountains as a personal practice of healing and self care. I didn’t have a language for it at the time but I was finally feeling connected in a way that was very different from my overall sense of feeling separate from. My first feelings of disconnect began at a very early age when I started expressing a more masculine gender presentation. I knew I was a girl but many other people did not. By the time I was 5, my parents had given up on forcing me into dresses and allowed me to have short hair. This was a rarity in the early 80’s so the messages I received at school and out in the world was that there was something inherently wrong with me. I internalized messages like I was in the wrong body or in the wrong society or possibly even in the wrong world. But when I went deep into the woods, I felt connected and part of something bigger than the human world. There was no one telling me I was in the wrong bathroom and there was a clear and vital relationship of reciprocity between all beings. Even with the trees that had fallen, I noticed how the moss and mushrooms took over and how little creatures and insects made their homes in and around these “logs”. Around the same time that I started spending extended periods of time in nature, I also began meditating and reading various philosophies and seeking community and practices geared towards expanding my perspectives on how to relate better with other people and this ultimately led me to wanting to relate better with all beings. 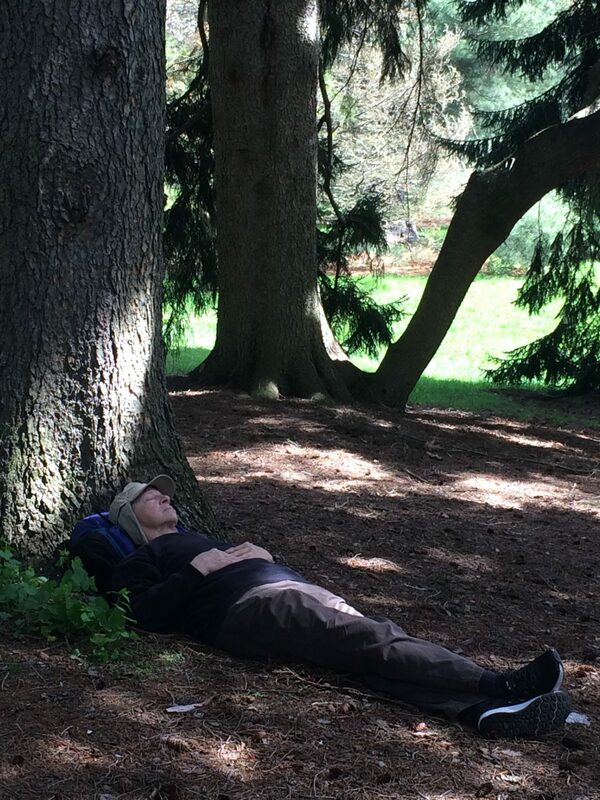 In my process of working towards being a more connected, compassionate and woke being, I discovered Forest Bathing and this global effort to tend to the stressful conditions of living in modern industrialized civilization. 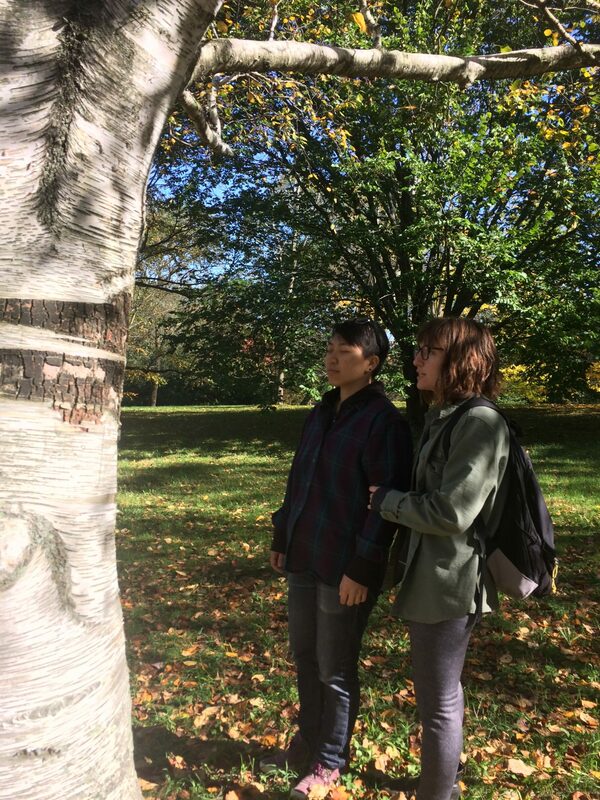 Inspired by Shinrin-Yoku, a term coined in Japan in the 1980’s, Forest Bathing is a prominent feature of preventative medicine and healing in Japan. A plethora of studies have been done demonstrating how nature is proven to be powerful medicine in treating stress-related illnesses. Some trees have been shown to emit cancer-fighting medicinal chemicals that can be absorbed by simply spending time relaxing near them. There is scientific evidence of a variety of health benefits such as reduced stress, lowered cortisol levels, reduced blood pressure, increased natural killer disease-fighting cells (NK cells), increased energy, improved sleep and mood. I knew right away that I wanted to guide Forest Bathing walks in Jamaica Plain. After a year of thinking about it, I finally went searching for community in an effort to learn more about this practice. I found The Association Of Nature and Forest Therapy Guides and Programs and eventually enrolled in their Guide Certification Program where I attended a week long intensive training followed by a six-month mentored practicum. It was a truly life altering experience and I quickly began creating Toadstool Walks. Having over a decade of experience being self-employed was incredibly beneficial in setting up Toadstool Walks. I was able to build myself a website and I already had a system of invoicing and billing. So I pretty much poured myself into this, initiating contact with local parks and land managers, connecting with folks I already knew from living in JP for 20 years and just getting the word out. 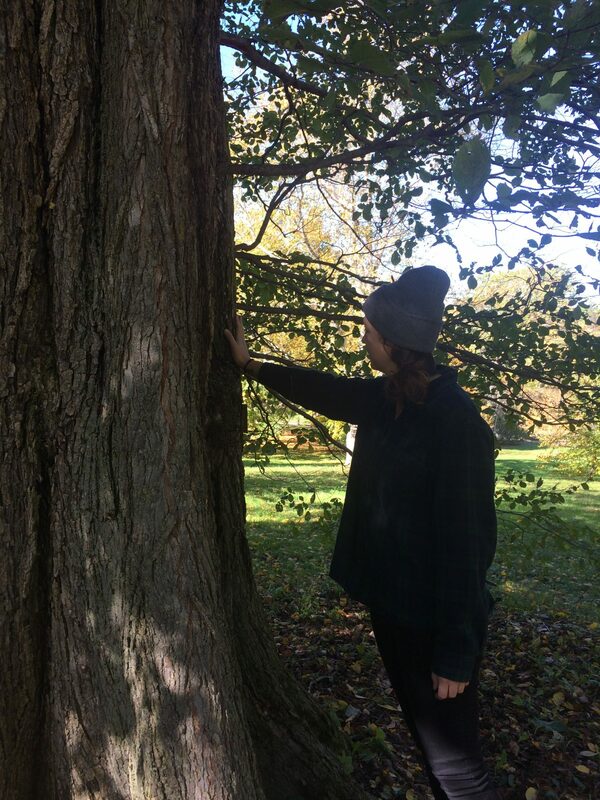 This has been my first summer working as a Certified Forest Therapy Guide and I have guided walks in various places including the The Arnold Arboretum of Harvard University, Rainbow Lifelong Learning Institute, Showa Boston, Massachusetts Audubon’s Moose Hill Wildlife Sanctuary, The Yoga Space At The Farm, and The Emerald Necklace Conservancy. 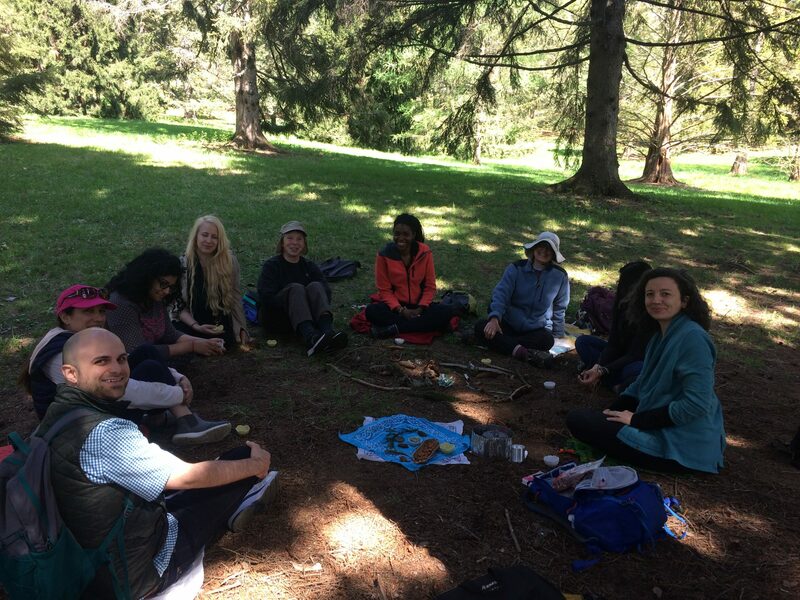 I also designed and guided a weekend-long Forest Bathing Retreat with The Venture Out Project in the pacific northwest. I have begun assisting on trainings with The Association Of Nature and Forest Therapy Guides and Programs am currently working towards becoming a mentor and trainer. Forest Bathing or Forest Therapy is one of those things that simply has to be experienced in order to be understood. I’ve scene the terms misused in media and I’ve scene people roll their eyes referring to it as ‘hiking’ or calling it a trend or a fad. The truth is, land connection is an ancient practice and our species evolved in forests before we industrialized at lightning speeds. Forest Bathing is not hiking. I say this as someone who is both an avid hiker and a Forest Therapy guide. Hiking is a great way to get exercise and get outside but not everyone can hike or get out of the city or gain access to the outdoors. 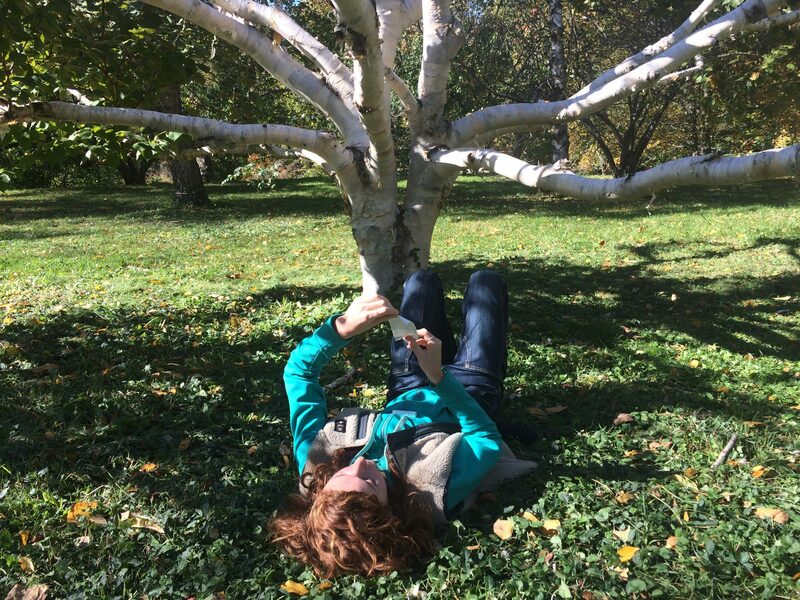 The amazing thing about the practice of Forest Bathing is that it can offer some of the same restorative benefits as a backcountry trip can offer yet Forest Bathing doesn’t require any special gear, and it can happen almost anywhere, by anyone regardless of physical abilities and it doesn’t require a large time commitment in order to experience this sense of freedom, peace, restoration and connection. Toadstool Walks – what should we know? What do you guys do best? What sets you apart from the competition? Toadstool Walks offer slow-paced guided wanderings that promote wellness through a series of gentle sensory-opening invitations that welcome us to notice more of our natural surroundings. 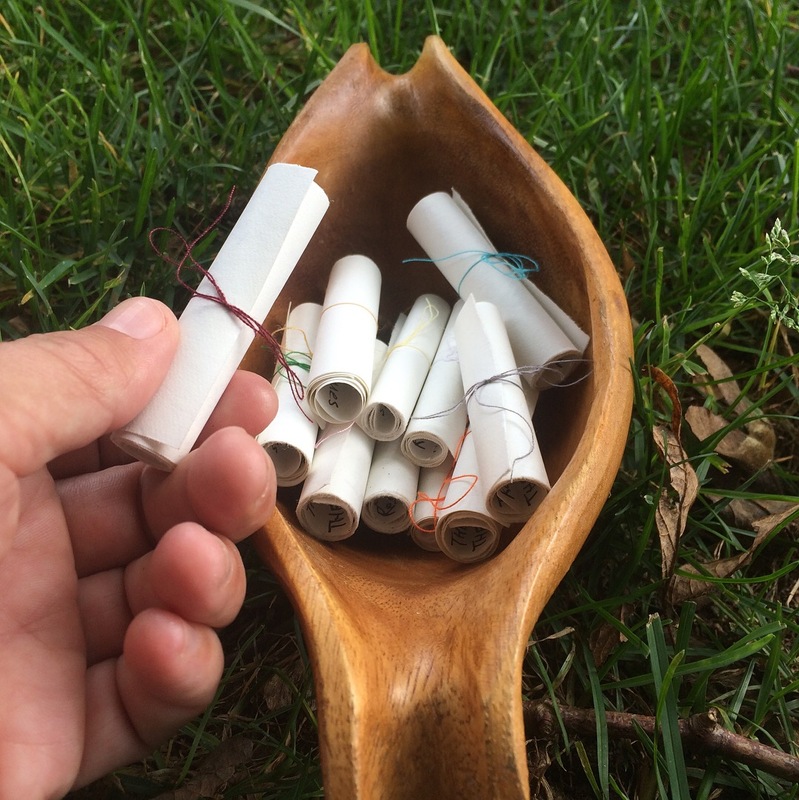 These therapeutic experiences support a deepening connection with the natural world, opening us to the healing medicine of the forest. I believe the practice of Forest Bathing can deepen and broaden our relationships. My training includes an understanding of both the scientific framework of Forest Therapy as well as the cultural repair that is made possible by holding space for seekers of this medicine to share and bear witness in community with the natural or more-than-human world. As a queer gender variant trauma informed person with a social justice lens and 10 years of experience working with local queer youth, I make a huge effort to set an intention of safe space on my walks by using inclusive language and being super clear that everything I offer during my walks is optional and open to interpretation. I also keep myself open to ways I can be more conscious, compassionate and aware. 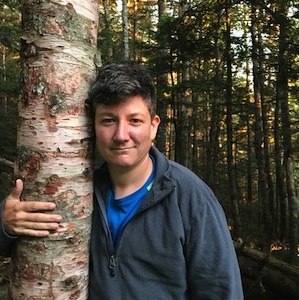 I am motivated by the possibility for cultural repair and want to invite people to come together by creating inclusive space that can hold and even celebrate all our differences while finding ways to connect through our connections with the natural world by acknowledging that we are all part of that. Ultimately, success for me means truly believing that we are all loveable. I am motivated by compassion, vulnerability, and humility. I want to walk through life with an open tender heart and be willing to acknowledge the experiences of my fellow beings no matter how painful or uncomfortable this can be. Bearing witness to others, speaking my truth, and letting in all the stories without judgement or defensiveness is how I define success. As a white person guiding nature connection experiences on colonized land, I am constantly holding this question of how to do so with integrity, respect, grace and consciousness. With acknowledgment to living in a capitalist society, I don’t try to deny being a capitalist but I do constantly consider what kind of capitalist I am. I am not that motivated by money but I do want to pour myself into this work. I don’t see Toadstool Walks so much as a business or a company, its more of an offering and a calling. I actually feel a responsibility to do this work. In order to be of service in my community in this way, I have to be in partnership with the land, the beings and acknowledge the histories that have led us to this disconnected place in the first place.